You are a customer of Octopush and you would like to use our API SMS service. You probably have a software or application solution in which you would like to integrate or automate SMS dispatch. We are offering an effective and certificated solution which consists of several examples in php format which enable you to integrate our API SMS and send SMS in just a few minutes. Right click and then "save the link target as..."
Grâce à l'API SMS SMTP de Octopush, vous pouvez automatiser l'envoi de SMS depuis votre plateforme en envoyant un email. En respectant certains paramètres, l'envoi de SMS sera déclenché automatiquement à la réception de l'email. Automatically receive deliveries and blacklisting requests (STOP)!! Send us the url(s) which we can use to send you the AR or STOP HTTP requests as soon as they arrive! You will no longer have to ask on our server! Implementing an API SMS is not always easy. Octopush has been working with simplicity and effectiveness in mind. 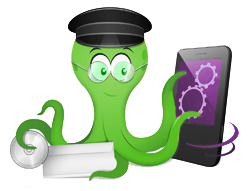 Although the API SMS of Octopush is one of the easiest to set up, it has been adapted and is reserved for developers. However, you may contact our technical team regardless of the problem or question you have. You have a telephone number for that: 04.13.41.50.70 from 8am to 8pm 7 days a week, or our form of Contact.